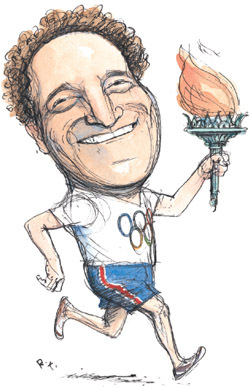 A New York City deputy mayor runs with a plan to host the 2012 games. Daniel Doctoroff, JD’84, is not a graceful loser, perhaps because he hasn’t had much practice. Fresh out of law school, Doctoroff talked his way into an investment-banking job—and went on to make millions for his clients and himself. His one big loss, a $14-million drugstore-chain investment that went bust in the early 1990s, was so “personally painful,” he says, he refused to enter a drugstore for two years. Now New York City’s deputy mayor for economic development and rebuilding, Doctoroff is the point person for Ground Zero; he also played the lead role in landing the Republican National Convention. But his grandest plan, his obsession for more than a decade, is for New York to host the 2012 Olympic Games. What began as an outsider’s pipe dream is now closer to becoming reality than most people—maybe even Doctoroff—could have imagined. Two years ago the United States Olympic Committee chose New York as its host-city candidate. In May New York made the list of finalists, along with London, Madrid, Moscow, and Paris. The winner will be announced next July. Driven more by a “very, very deep love of New York City” than a love of world-class sports, he sees his Olympic campaign as a way to give something back to his adopted city—“the ultimate meritocracy,” he calls it. Born in New Jersey, Doctoroff grew up in suburban Detroit; his mother was a psychologist, his father an attorney and state appeals judge. A sports fan, but not a fanatic, he attended the 1968 World Series when he was ten and played competitive sports until he was sidelined by injuries as a high-school freshman; at Harvard University, where he majored in government, he managed the baseball team. There he also met his wife, Alisa, in a freshman economics class, deciding on their first date that she was the woman he would marry. Today the Doctoroffs have three teenage children, Jacob, Ariel, and Jenna. Doctoroff was equally uncomfortable at the NYU placement office, where he discovered the chances of making partner at a New York firm were 30 to 1. Deciding he didn’t like the odds—or law—he landed an analyst’s job at Lehman Brothers, though he had taken only one law-school accounting course (“Why am I taking this? I’ll never use it,” he wondered at the time). At Lehman he specialized in merchant banking, corporate finance, mergers and acquisitions, corporate restructurings, and reorganizations. One night, coming home exhausted after another 18-hour day, he paused to enjoy the pinprick lights of the skyline and realized he had fallen in love with New York. At work Doctoroff performed so well that after three years, Lehman client and Texas billionaire Robert Bass asked him to join his new private investment company, Oak Hill Capital. During 14 years at Oak Hill Doctoroff led the purchases of companies in information services, insurance, thrifts, cable television, hotels, and leasing. He won’t specify how much money he made, but here’s one indication: he gives away more than $1 million in philanthropy each year, primarily to academic institutions, Jewish charities, and Human Rights First. At first he shared his idea with only a few close friends, even as he quietly researched it for a year and a half in what he calls an “intellectual exercise.” Convinced it could work, he developed a plan massive in scope but meticulous in detail. Next he called Teeter, his old boss, for advice. Impressed, Teeter took him to Robert Kiley, then chair of the Metropolitan Transit Authority. Kiley invited Doctoroff to speak to the New York City Partnership, the city’s leading business and civic organization, and introduced him to Mayor Rudolph Giuliani. A political neophyte, Doctoroff got lost on the way to City Hall. By late 2001, as Mayor-elect Michael Bloomberg prepared to take office, Doctoroff was no longer an outsider; he was the transition team’s top choice for the economic-development job. He twice turned down the offer, concerned about the time commitment and overwhelmed by his mother’s recent death and his father’s terminal illness. When he met Bloomberg in person, however, he rethought his decision: “I cannot say enough good things about him.” He agreed to take the job, earning the same salary as his boss: $1 a year.